When it comes to dissecting messages in movies, I must say that the disability experience holds a special place in my heart because my masters thesis focused on this lens of literary analysis. The disability experience has been neglected over the years. Much has been written regarding how women have been portrayed, how people of different races have been portrayed, how people who are homosexual are portrayed, and so forth. On the other hand, the disability studies field is relatively new and lacking in number of scholarly articles with this critical lens (at the time of this entry, the only scholarly journal devoted to such analysis is the Journal of Literary and Cultural Disability Studies, which debuted in 2007). Nonetheless, it is important to consider the disability experience just as one might consider any other human experience. By analyzing the portrayal of disability in literature and films, we can begin to understand how societal attitudes and beliefs about disability have been informed and developed. What better place to start than by looking at classic movies? The other night I tuned in to Dark Delusion (1947) because it starred Lucille Bremer, whose work I have been wanting to see more of. Imagine my surprise when in rolls Dr. Gillespie (Lionel Barrymore), a wheelchair-bound character featured in over a dozen films during the '30s and '40s. Unbeknownst to me, Dark Delusion was the last of the Dr. Gillespie (originally Dr. Kildare) series. 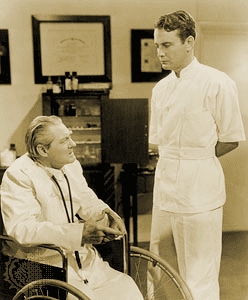 protege Dr. Kildare (Lew Ayres). Dr. Gillespie is part cantankerous old man, part clown, and part caring mentor. He is the ideal boss or father, a lovable character portrayed by one hell of an actor. In the lighter moments of this installment of the series, he plays poker with the guys and intercepts a "top secret" telegram, a joke that he and his staff pull on one of the doctors. In the more serious moments, he mentors Dr. Coalt (James Craig), guiding him to the solution without the young doctor realizing it at the time. In other films of the series, Dr. Gillespie oversees and sometimes even lends a helping hand during difficult operations. Traditionally, characters with disability inspire fear (Mr. Potter - also portrayed by Lionel Barrymore - in It's a Wonderful Life) or evoke pity (Quasimodo in The Hunchback of Notre Dame). Sometimes they are considered weak (Tiny Tim in The Christmas Carol) or in need of being fixed (Charly in Charly). But not Dr. Gillespie; he is a positive image of disability. The only time Dr. Gillespie's wheelchair; i.e., limitation, becomes noticeable is when he asks someone to open the door or to bring a patient downstairs (if not in the hospital where there is an elevator). It is interesting to note that Dr. Gillespie was not originally written as a wheelchair-bound character. Lionel Barrymore broke his hip, prompting the need for the chair. (His arthritis kept him in the chair during the later films.) As a result, the Dr. Gillespie character was written first as a man; the wheelchair was secondary. This is how characters with disabilities should be written--as whole people with personalities that do not revolve around their disability. As refreshing as it is to see the positive portrayal of disability, the fact that this occurred somewhat as a fluke may help explain why the screen does not reflect the societal attitude toward disability during the time it was made. Special care was taken to ensure that the public did not see President Franklin Delano Roosevelt in his wheelchair, which represented weakness in the eyes of the American public and the rest of the world. In addition to the positive portrayal of disability, I feel I have to note that Dark Delusion (and I'm assuming the rest of the Gillespie movies, but I haven't seen all of them) also portrays race in a positive light as well. 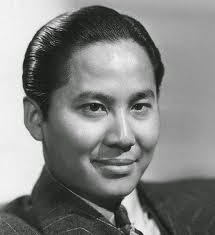 Dr. Lee (Keye Luke) is a Chinese American doctor in Gillespie's hospital. Unlike so many Asian characters during this time period, he speaks without a pronounced foreign accent and heals based on medical facts rather than ancient "Oriental" wisdom. I will point out, however, that there is an African American staff member who speaks with an exaggerated "slave" sound (I'm not sure how else to describe it), so the movie is not completely without flaws. If you would be interested in catching Dr. Gillespie in action, tune in to TCM Saturday afternoons at 1:30 pm PST during September and October.